Dr. Allan Ring has been associated with our practice since 1997. A native of Kansas, Dr. Ring received his Bachelor of Science and Business Administration degrees from Emporia State University in 1968. After completing his military service, he returned to Kansas State University. He received his Doctor of Optometry degree in 1977 from Southern College of Optometry in Memphis, Tennessee. 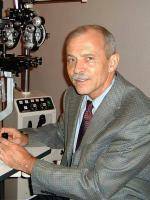 In addition to being a certified therapeutic optometrist, Dr. Ring also completed the Optometric Glaucoma Specialist course. Dr. Ring is committed to providing professional and quality eye care to our patients.